John C. Bogle’s financial innovations were reviled and ridiculed at first, but for decades now the low-fee index funds he pioneered have enabled millions of ordinary Americans to build wealth to buy a home, pay for college, and retire comfortably. John C. Bogle’s financial innovations were reviled and ridiculed at first, but for decades now they have enabled millions of ordinary Americans to build wealth to buy a home, pay for college and retire comfortably. Mr. Bogle, who championed the interests of the small investor, and railed against corporate greed and the excesses of Wall Street, died of cancer at age 89 Wednesday at his home in Bryn Mawr, Pennylsvania. A chipper and unpretentious man who invited everyone to call him “Jack,” he was founder and for many years chairman of the Vanguard Group, the Malvern, Pennsylvania-based mutual-fund company, where he pioneered low-cost, low-fee investing and mutual funds tied to stock-market indexes. In 1999, Fortune named Mr. Bogle one of the investment industry’s four giants of the 20th century, and in 2004, Time listed him among the 100 most influential people in the world. While Mr. Bogle was facile with numbers, he was much less interested in counting than in what counts, and his intellectual range was broad. He revered language, history, poetry and classical wisdom, and frequently amazed and delighted people by reciting long passages of verse. He was the author of at least 10 books, mainly about investing — all of which he proudly wrote himself. 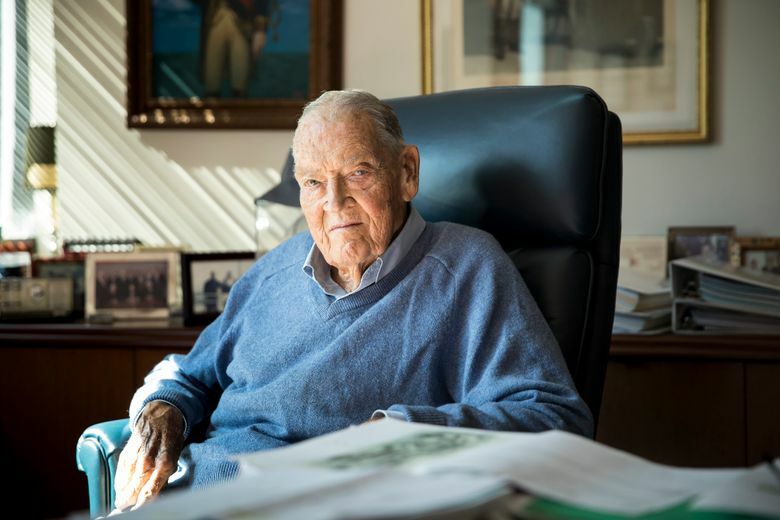 He was a social critic, civic leader, mentor and philanthropist whose generosity to the institutions that shaped his character, notably Blair Academy and Princeton University, far outstripped his legendary frugality. Mr. Bogle outlived three pacemakers, and kept a gym bag with a squash racket near his desk. In 1996, surgeons at Hahnemann University Hospital replaced his faulty heart with a strong one, ending a 128-day wait in the hospital. He reunited with his doctors years later. Mr. Bogle had hoped that the Vanguard model — “structurally correct, mathematically correct and ethically correct” — would goad other investment firms to give customers a fairer shake. While index funds have become widely popular, Vanguard’s competitors often have been less than keen about following the company’s penny-pinching lead. When he was not touting the advantages of the Vanguard mode of investing, Mr. Bogle, a self-proclaimed “battler by nature,” was lambasting his professional brethren for “rank speculation,” reckless assumption of debt, “obscene” multimillion-dollar paychecks and golden parachutes, and saying they had abdicated their duty as stewards in favor of self-interested salesmanship. Mr. Bogle characterized his pugnacious relationship with the financial industry as “a lover’s quarrel.” His mission, he said, was simple: to return capitalism, finance and fund management to their roots in stewardship. John Clifton Bogle early realized the value of a penny. His grandfather, a prosperous merchant, founded a company that became part of the American Can Co., and Mr. Bogle’s early years in Montclair, New Jersey, were affluent. Then came the Great Depression, which erased the family fortune. Mr. Bogle’s father, an improvident charmer, was ill-equipped to cope. The Bogles lost their home and were forced to move in with relatives. Headstrong and impulsive, Mr. Bogle arranged a merger with highflying investment managers in Boston. For six go-go years, the partnership flourished, but when stock prices plunged in 1974, Mr. Bogle was fired.